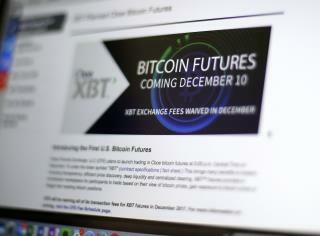 (Newser) – The first-ever bitcoin future jumped after it began trading Sunday as the increasingly popular virtual currency made its debut on a major US exchange. The futures contract that expires in January surged more than $3,000 to $18,010 four hours after trading launched on the Chicago Board Options Exchange, the AP reports. The contract opened at $15,000, according to data from the CBOE. The CBOE futures don't involve actual bitcoin. They're securities that will track the price of bitcoin on Gemini, one of the larger bitcoin exchanges. The start of trading at 5pm CST overwhelmed the CBOE website, though the exchange said trading in futures had not been disrupted. PEOPLE! Look at how hard ALL FINANCIAL institutions wanted this to tank....... What do they control???? On Bitcoin, for the dubious The inventor of bitcoin is basically a phantom, no one knows if Satoshi Nakamoto even exists ... Oh, Satoshi Nakamoto exists but his real name is Verbal Kint. Still don't get it Bitcoin is supposed to replace currency as I understand it and yet bitcoin is valued in dollars? OK, put that aside for the moment. Bitcoin is supposed to replace currency but it is not currency? OK, belay that. Bitcoin is the 'new' way to circumvent government control of wealth and allow US to trade with each other in 'total freedom' but the value of a bitcoin can go up or down on whim? Now, I get that ... Freedom isn't free. NOW, in regard to bitcoin? Give me good old U.S. dollars and let's get on with Our Freedom.